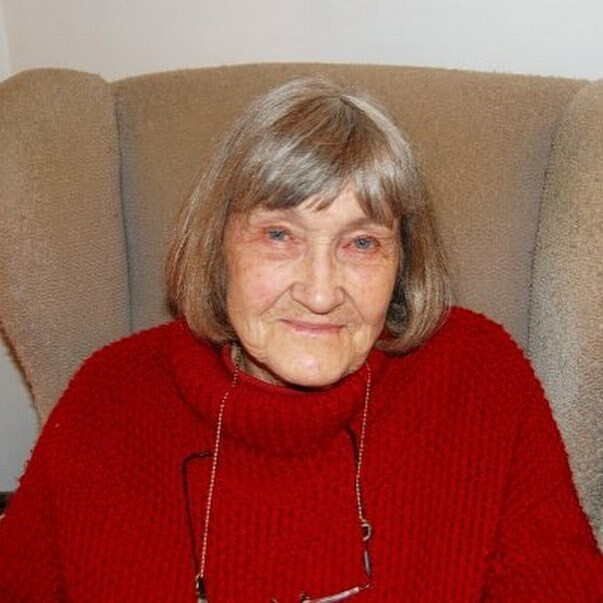 It is with great sadness that we announce the passing of Jean Hobson on 3rd March 2019. 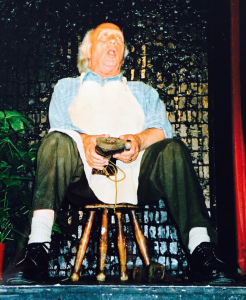 In 1997, Jean founded Pastiche with Jean George to raise money for good causes and to have fun through performing. Jean was Pastiche’s first Director, directing a total of 28 productions starting with The Boyfriend in 1997 until her last production at the helm (Kiss Me Kate) in 2011, before passing on the directorial baton to her daughter Roma. During that time, Pastiche raised just under £49,000 for multiple charities. Using our productions to raise money for local and national causes was a founding ethos of the company – something we as a company are very proud to continue to this day. 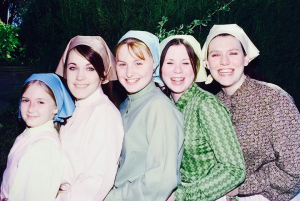 Jean, along with Jean George and many other helpers, created many of our costumes during our first fifteen years. The standard of her work was often praised by not just our company and audiences but also reviewers in the local press. Jean was a one woman recruiting team for Pastiche. She had a knack for spotting talent in individuals and getting the very best from them, often giving the individual the confidence to step foot on the stage for the first time or become involved in the theatre. It’s not an exaggeration to say that every one of us involved with Pastiche are here due to her belief in us. When Jean retired from the company, the number of company members (past, present and indeed future) who gathered at a surprise leaving event for her was testament to the impact she made on the local theatre scene. Even after retiring from the Director’s chair, Jean continued to keep a close eye on things at Pastiche, succeeding her husband Alan to become President of the company. Jean provided support and inspiration to Roma during her tenure as Director and continued this when Olivia succeeded Roma as Director – something we know that Olivia has cherished. She continued to attend rehearsals and performances to see how things were going – always watching from her usual seat in the Compass auditorium. We were honoured to dedicate her usual seat to her in 2017. All at Pastiche will miss Jean very much and will continue to ensure that her legacy of our company lives on. We send our love and best wishes to all of Jean’s family at this time. 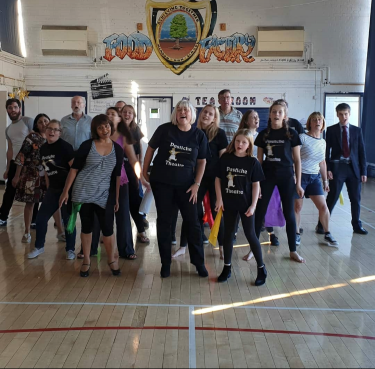 Pastiche are beavering away on their upcoming production of Musical Masterpiece, which opens to the public in two weeks time (Thursday 4th October) at the Compass Theatre. Featuring songs from famous shows and films, Musical Masterpiece features something for everything including a tribute to Musical Theatre giant Andrew Lloyd-Webber as he celebrates his 70th birthday later this year. As always, Pastiche will be raising money for a worthy cause with our production. 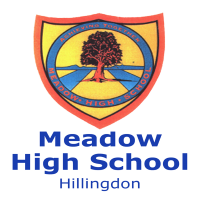 This time we will be donating to Meadow High School based in Hillingdon. Meadow High School is a very large Secondary Special School that caters for pupils with complex learning needs. The school was built in 1966 for 90 pupils and 30 staff but over the years has grown to house 240 pupils and 120 staff. The school is about to have a significant rebuild to bring it up to modern specification. The money raised by Pastiche will be used to purchase equipment which cannot currently be accommodated in the old building. Meadow is a second home to Pastiche as they very kindly provide us with rehearsal space. We are thrilled to be raising funds for this wonderful school. A cheque for £595.56 was presented by Olivia Holburd, Director of Pastiche Musical Theatre to Relate North West London. The money was raised by audiences of our recent production of Wild, Wild Women at the Compass Theatre at the end of March 2018. 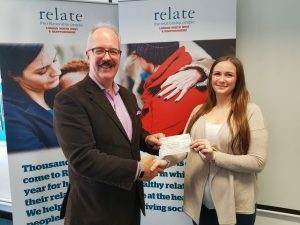 Relate are delighted with the funds raised by Pastiche and offered a heartfelt ‘Thank You’ from everyone at Relate. The amount raised during Wild, Wild Women now takes the total amount raised by Pastiche to over £57,000! We now hope to break the £58,000 barrier with our upcoming production of Musical Masterpiece at the Compass Theatre in October 2018. 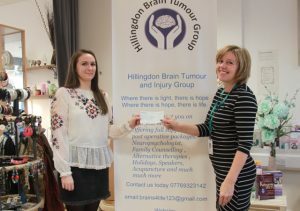 A cheque for £633.94 was presented by Olivia Holburd, Director of Pastiche Musical Theatre to Becky Haggar, co-founder of the Hillingdon Brain Tumour and Injury Group. 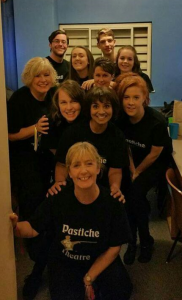 The money was raised during the annual Pastiche Summer Concert ‘Musical Milestones’ held at the Compass Theatre in September 2017. Becky was delighted with the funds raised by Pastiche and offered a heartfelt ‘Thank You’ from everyone at the Hillingdon Brain Tumour and Injury Group. Formed in 2009, the charity’s aims are to provide active support to anyone in the Hillingdon and surrounding areas affected by any type of brain tumour or brain injury. They do this by seeking to help patients, carers, friends and family live as full a life as possible, with the best quality of life. The charity also raises awareness in the local medical and general community of the symptoms and effects of brain tumours. The charity takes pride in offering a unique, life-improving post-operative package for all of their members – including access to neuropsychologists, complementary therapists and all the assistance and advice they need. The amount raised during Musical Milestones is the highest amount raised during a Summer Concert since 2010, which tops off a remarkable year for Pastiche. Both this show and ‘Hello, Dolly!’ have raised just short of £2000 for two local charities during our twentieth anniversary year. 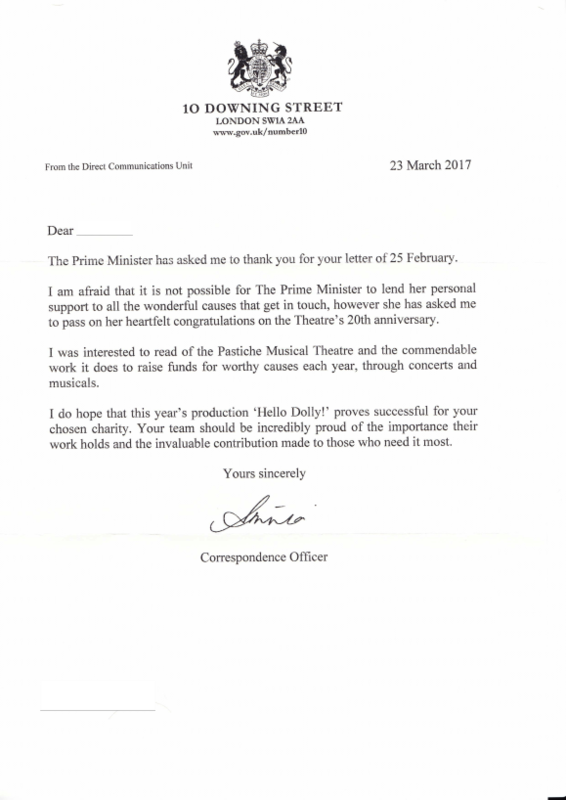 Pastiche have received a letter of congratulations on our 20th anniversary from the Prime Minister, Theresa May. The letter which was received is below. We thank the Prime Minister’s office for taking the time to congratulate us. Today marks 20 days until Pastiche’s production of Hello, Dolly! opens at The Compass Theatre in Ickenham. This production is a special one, as Pastiche marks it’s 20th birthday in 2017. One of our company has performed in 31 of 39 of our shows! “The Boy Friend” was Pastiche’s first performance and opened at The Compass Theatre in Ickenham on Tuesday 21st January 1997. This performance was the start of a relationship with The Compass which is now twenty years old and has led to the company staging over 150 individual performances at the theatre. We will be staging our 40th production on the Compass stage in March 2017. A pretty remarkable achievement! In the first fifteen years of its existence, Pastiche raised an incredible £50,000 for over thirty different organisations and charities based locally and nationally – supporting causes from Alzheimer’s to Great Ormond Street. We choose the organisations we raise funds for as a group and in most cases, the organisations are close to one or several of our member’s hearts. We are hoping that in 2017, our 20th year, we will break the £55,000 barrier. Tickets are starting to sell fast so book now to avoid disappointment!! Today marks 30 days until Pastiche’s production of Hello, Dolly opens at the Compass Theatre in Ickenham. The cast have hit a major milestone with the completion of staging the show and are now in run throughs to polish and perfect our show ready for our audiences. Today marks 50 days to go until our 20th birthday production of Hello, Dolly! opens at The Compass Theatre in Ickenham. Both the Pastiche and Compass Box Offices are now open and tickets are starting to sell. To mark Pastiche’s 20th birthday we are for the first time offering a group rate on our tickets through the Pastiche Box Office – if you buy 10 or more full price seats for a single performance you will receive a £2 discount on each seat. Don’t miss out on what looks like Pastiche’s most spectacular production yet!